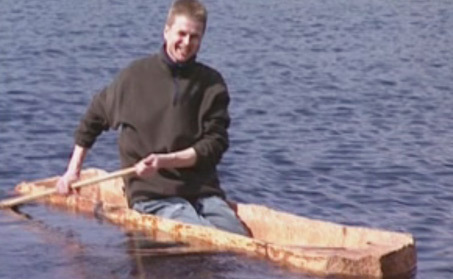 On April 11, 2001 came a redemptive answer to a pressing question: the vexed prehistoric Pesse canoe, the world’s oldest boat was indeed a boat and it did sail! Rumors arose that the canoe is really a feed trough for the cattle, but since yesterday, the archaeologists of the Museum of Drenthe tormented by the doubt. They made an exact copy of the ancient boat and let it float in a fen nearby Witten. And there: without hesitation put the replica containing a skilled boatman course to open water, it turned several laps and returned back to remain ashore. The people of the Drenthe Museum in Assen, led by the archaeologist Jaap Beuker, were reasonably certain of their cause, but also their faces were tense as their brainchild broke away from the reeds and glided into the middle of the lake. But launching and launch trials succeeded wonderfully. For five days, Jaap Beuker with a dozen employees worked a trunk of a pine into an exact duplicate copy of the Pesse canoe. Then, in the fen in the holiday area near Assen Witterzomer, they held a trial run. The canoe was found to be fairly deep but gave no further shrinkage, it responded willingly to paddling, and a few nautical maneuvers. Canoeist Dielemans was satisfied. For him it was quite clear: with such a boat, so primitive, carelessness about 10,000 years could lead great danger. The hunter would be sitting on his knees, half-crouching or standing, with his fishing or hunting gear. The tall Dielemans could do this. The small size of the canoe indicates that prehistoric man quite a bit smaller in stature than himself. 10,000 years ago, no animals were kept and there were therefore no need troughs. The Canoe of Pesse boat similar to findings in other countries. In what is presently known as Poland today, there are still very primitive boats of this type used. The trial run with the replica can be called successful. The sum of all this is that I dare to exclude that the Pesse Boat ever had a usage other than navigating. Special guest at the trial were Ms. Tijssien Wanders-Gort, the wife of the farmer who in 1955 took Pesse Boat. Her two granddaughter Talitha and Mylène Hopman (then 12 and 9 years old) were there, they were baptized the replica boat. Here was also played with the thought to get the finder Hendrik Wanders to the waterfront, but the old man was staying in a nursing home and the trip would have been too inconvenient for him.